As we advance into artificial sensing technology, it is pertinent that use of such technology be made to advance the interests of humans in general and improve the quality of life. Such motives have mostly been the driving force of technologies. For what is invented for space exploration helps fight diseases on earth and other examples include what was designed for war later supplementing great engineering technologies. The end result is usually the driving force or as a side motive at minimum. The advancement of nanotechnology means much more components in the same space and hence much smaller equipments. Sensors, were they small enough, could be used to replace the complicated biological and natural sensors in humans or animals and even be given to computers and robots. Usage of Quantum Dots explore such a use of a nanosensor and design it so as to restore the vision of visually impaired humans or give eyesight to computers; not using something as crude and huge in size as a camera or a lens rather targeting the core of sensing itself. Inherently, this research targets the retina itself. An artificial replacement for retina would enable humans to benefit from a restored vision without invasive brain surgeries. Computers, at the same time, will be able to detect photons with a much much greater sensitivity than a normal digital camera based optical detection method. Photo-detection needs a complicated device or materials engineered to the extent that the sensor would not be a physical obstruction in terms of its size when placed in the human eye or as an attachment to it as well as be biocompatible. To keep up with both these de facto requirements and many others implications of them, extensive study of the mechanism and biocompatibility has been done in research work for the selection of the materials and the literature shows an in-depth detail on why the materials chosen would make graphene and graphite based quantum dots a great candidate combination for such sensors. They can be used with two routes in the basic design; the generation of photocurrent via quantum dots on detection of photons or polarization of human nerves to fire neurons via quantum dots whenever photons are detected. Cheng, Shih-Hao et al. All Carbon-Based Photodetectors: An eminent integration of graphite quantum dots and two dimensional graphene. Scientific Reports 3, Article number: 2694. Published: 18 September 2013. Tang, L. et al. Deep ultraviolet photoluminescence of water-soluble self passivated graphene quantum dots. ACS Nano 6, 5102–5110 (2012). Li, Y. et al. An Electrochemical Avenue to Green-Luminescent Graphene Quantum Dots as Potential Electron-Acceptors for Photovoltaics. Adv. Mater. 23, 776–780 (2011). Li, X. et al. Large-area synthesis of high-quality and uniform graphene films on copper foils. Science 324, 1312–1314 (2009). Quantum Dots – A Definition, How They Work, Manufacturing, Applications and Their Use In Fighting Cancer Printable Document. Online Document: Accessed on: 27 May 2014. Lin, Rieke and Research groups. Quantum Dots and Cells. Website: Accessed on 27 May 2014. K. Novoselov, D. Jiang, F. Schedin, T. Booth, V. Khotkevich, S.Morozov, and A. Geim, Two-dimensional atomic crystals, Proc. Natl. Acad. Sci. USA 102,10451 (2005). Kian, P. L., Qiaoliang, B., Goki, E. & Manish, C. Graphene oxide as a chemically tunable platform for optical applications. Nat. Chem. 2, 1015–1024 (2010). Galande, C. et al. Quasi-molecular fluorescence from graphene oxide. Sci. Rep. 1, 85 (2011). Jingzhi, S. et al. The Origin of Fluorescence from Graphene Oxide. Sci. Rep. 2, 972 (2012). Sargent, E. H. Photodetectors: A sensitive pair. Nat. Nanotech. 7, 349–350 (2012). Konstantatos, G. & Sargent, E. H. PbS colloidal quantum dot photoconductive photodetectors: Transport , traps, and gain. Appl. Phys. Lett. 91, 173505–173508 (2007). Zhang, D., Gan, L., Cao, Y., Wang , Q. & Guo, X. 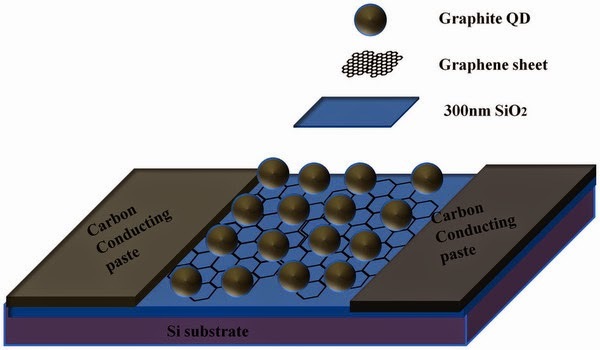 Understanding Charge Transfer at PbS-Decorated Graphene Surfaces toward a Tunable Photosensor. Adv Mater. 24, 2715–2720 (2012). Konstantatos, G. & Sargent, E. H. Nanostructured materials for photon detection. Nat. Nanotech. 5, 391–400 (2010).